Perfect location and very big rooms. Comfortable and clean. Def recommend. Excellent location. Everything was walking distance. The shops, the lake, and the church. The hotel offers complimentary laundry self service which was also very helpful for families on long holiday to refresh our clothes. That we had a kitchen was also fantastic we got to prepare our own food especially that most shops and restaurants were closed during the New Year holidays. Thank you Fraser Suites. Spacious room, well equiped and perfectly located. Location, big suite, in the middle of the shopping area, perfect staff, comfortable and almost everything. Location in the center of the shopping area and walking distance to the lake. Also the size of the room. The rooms were beautiful, bed was comfy. Bathroom was beautiful & came with robes & slippers. Shower head was a waterfall shower head. Free wifi.Kitchen was fully equipped including coffee pods. 2 large TV's. FREE LAUNDRY!! A decent gym. Staff was very friendly. Perfect location. Loved my stay & I would definitely recommend staying there. Excellent all around. Very central location, and modern luxury decor. Highly recommend it. Location in the middle of shops, Staff, and big comfortable 7 stars room. 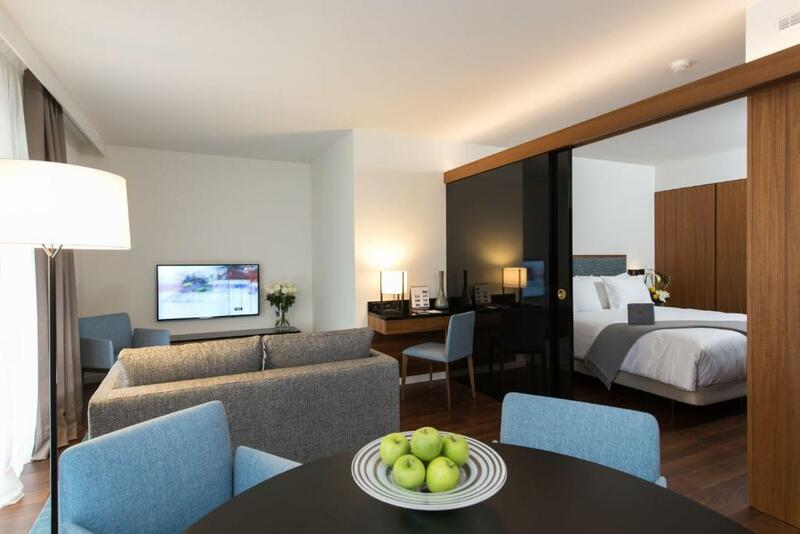 Lock in a great price for Fraser Suites Geneva - Serviced Apartments – rated 9.3 by recent guests! 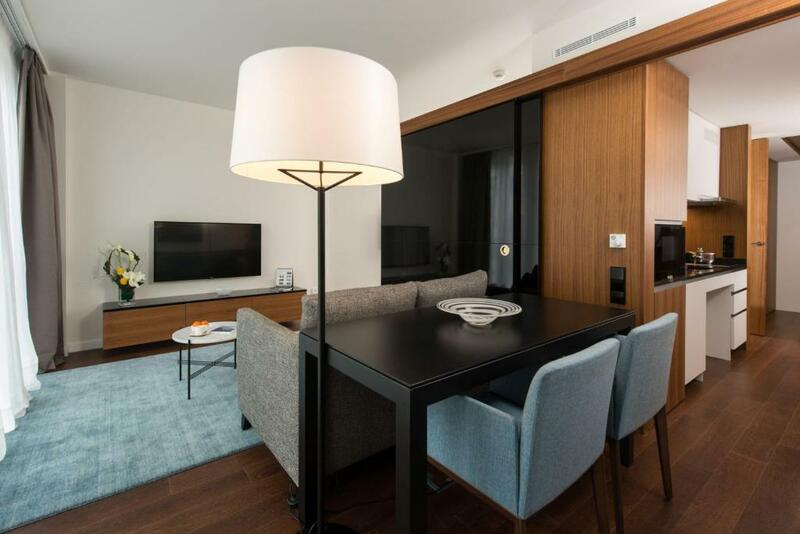 Fraser Suites Geneva - Serviced Apartments This rating is a reflection of how the property compares to the industry standard when it comes to price, facilities and services available. It's based on a self-evaluation by the property. Use this rating to help choose your stay! Fraser Suites Geneva is located in the Rue Du Marché District, 1,000 feet from St. Pierre Cathedral and a 10-minute walk from the Jet d'Eau, and offers self-catering accommodations units with free WiFi. The Gare de Cornavin Train Station is 2,650 feet from this nonsmoking aparthotel. 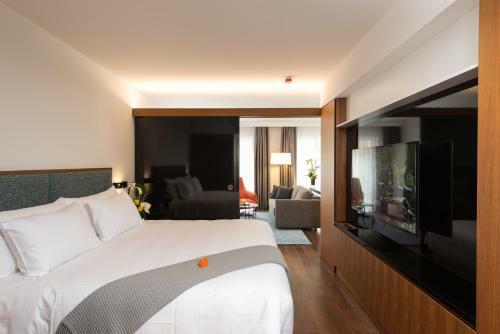 Each studio at the Fraser Suites Geneva is luxuriously furnished and comes with a well-equipped kitchenette, a flat-screen TV with satellite channels and a living area with a sofa. The bathroom is fitted with a shower, a hairdryer and free L'Occitane toiletries. Complimentary access to a fitness room is offered on the premises. Further amenities include a 24-hour reception, a 24-hour fitness center and a business center. Laundry facilities are available in-house, free of charge, while a dry cleaning service is available for an extra charge. United Nations Geneva is 1.4 mi from Fraser Suites Geneva. The nearest airport is Geneva International Airport, 2.5 mi from the property. Cité is a great choice for travelers interested in old-town exploration, shopping and cleanliness. 뀐 Located in the real heart of Geneva, this property has an excellent location score of 9.7! 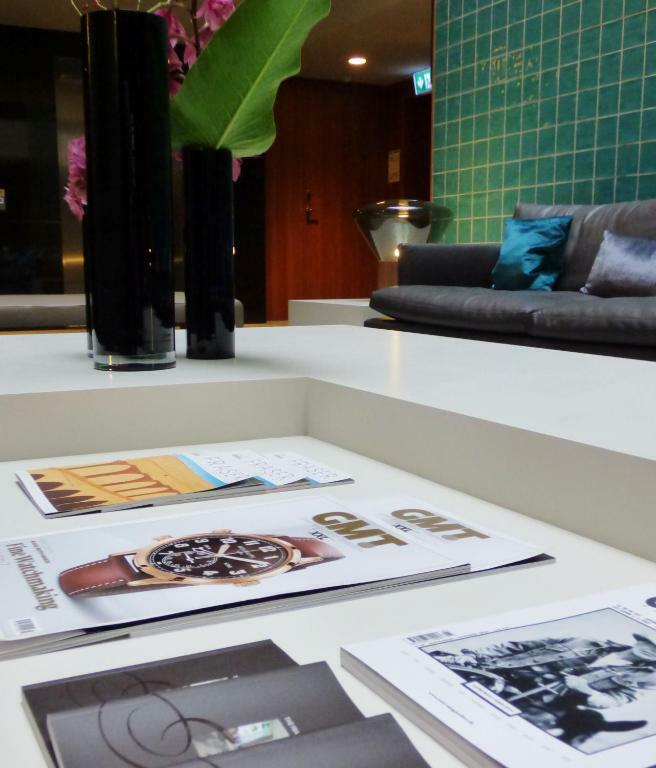 When would you like to stay at Fraser Suites Geneva - Serviced Apartments? 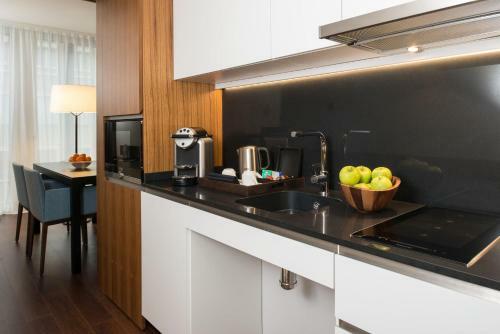 This contemporary fitted studio has a 32" LCD TV, kitchenette and a living area with a sofa. 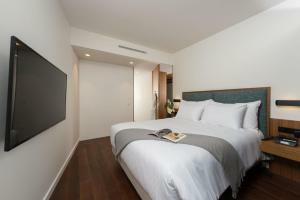 More spacious studio with a 32" LCD TV, kitchenette and a living area with a sofa. This studio with free WiFi features a fully equipped kitchenette, a living area, 2 LCD TVs, and a smartphone. The bedroom area is separated with sliding doors. The bathroom is equipped with a shower and free toiletries. Facing the Old Town, this studio with free WiFi features a well-equipped kitchenette, a living room with dining table, 2 LCD TVs, and a smartphone. The bedroom area is separated with sliding doors. The bathroom is equipped with a walk-in shower and free toiletries. 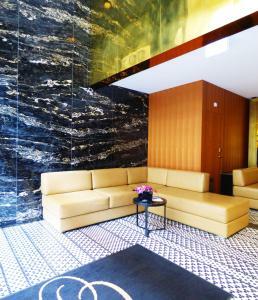 Fraser Suites Geneva is located in the heart of the Old Town, in a Business and shopping district. The property is housed in a building that used to be the headquarters of ROLEX. With its proximity to major city attractions, with some within walking distance Such as The Quays of Lac Geneva, Geneva Old Town, St Peter’s Cathedral Fraser Suites Geneva offers you the opportunity to stay in the very center of the city The property is fully non-smoking. House rules apply and can be sent prior to arrival. Area Info – This neighborhood is a great choice for travelers interested in old-town exploration, shopping and cleanliness – Check location Excellent location – show map Guests loved walking around the neighborhood! Geneva's old town, called the "Vieille Ville," features lots of charming shops and cafes, with a main square dating back to Roman times. House Rules Fraser Suites Geneva - Serviced Apartments takes special requests – add in the next step! Fraser Suites Geneva - Serviced Apartments accepts these cards and reserves the right to temporarily hold an amount prior to arrival. Please note that reservations are preauthorised from the moment that free cancelation is no longer possible. Guests booking a prepaid rate must present the card at the check-in that they used to make the reservation. This card must have the guest's name on it. Please note that extra beds are subject to prior approval and invoicing. You must request extra beds if more than 2 people will be staying in the rooms. There was a washer and dryer on the first floor of the hotel. The room was spacious and I loved the kitchenette with a capsule coffee machine and dishwasher. No room dining Complementary Cofee & tea are subject to extra charge after the first supply. carry your luggages by yourself. Its excellent for a 4 star hotel, the bed was very comfy, the suit was very clean and its in the middle of the city and near most of the shops within only walking distance. Very suitable for family with kids under 5 years. Would definitely be my first option when visiting again. This hotel has a really good vibe.......would highly recommend to the business or tourist as the location is excellent and the environment very comfortable indeed. Amazing hotel! Lovely team of staff working! Perfect facilities, exceeded my expectations! !